Two bombings over the past two days in Volgograd, Russia, have killed over 30. Because of the astrology, I warned of the possibility of post-Christmas violence here. This chart is for midnight between the first and second bombing: the same configurations apply to both events. Regular readers know the drill: mass-murderers (including many politicians) and mass-murder events have charts that conform to the Bloodbath Formula. 1. Pallas trine Pluto and contraparallel Jupiter: ethics compromised. 2. Venus decile Neptune and ruled by Saturn which is quindecile South Node: Venus (property rights including rights to one's own body) liquefied. 3. Pluto septile Saturn, ruler of Venus: Destruction (Pluto) of property including human bodies (Venus). 4. 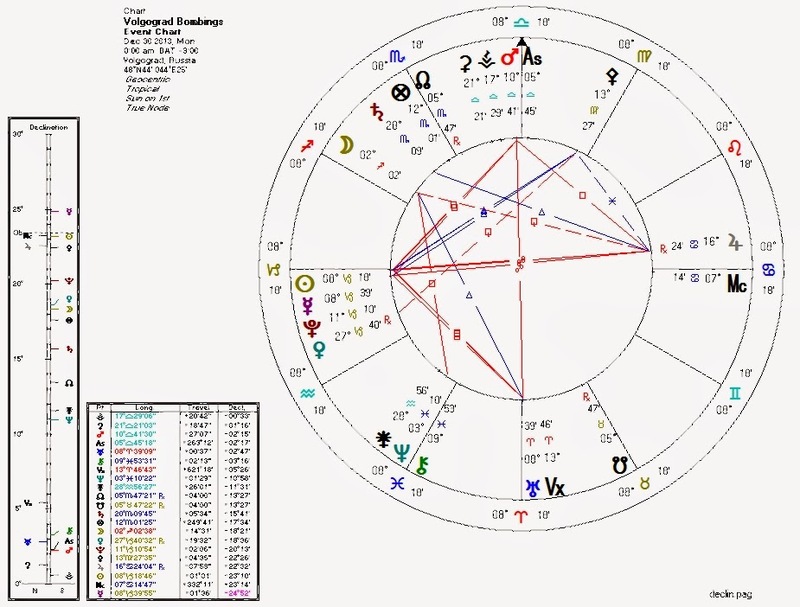 Pluto conjunct Sun. Days of death, as it were. 5. Mercury prominent -- conjunct Sun. I expect more violence between now and when Pallas is clear of Pluto and Jupiter. Pallas represents, among other things, the libertarian non-aggression principle. When she or her sign ruler is corrupted by Pluto, blocked by Jupiter, and/or drained by the South Node, evil is afoot. When the other factors in the Bloodbath Formula also come into play, we see lethal and senseless violence.